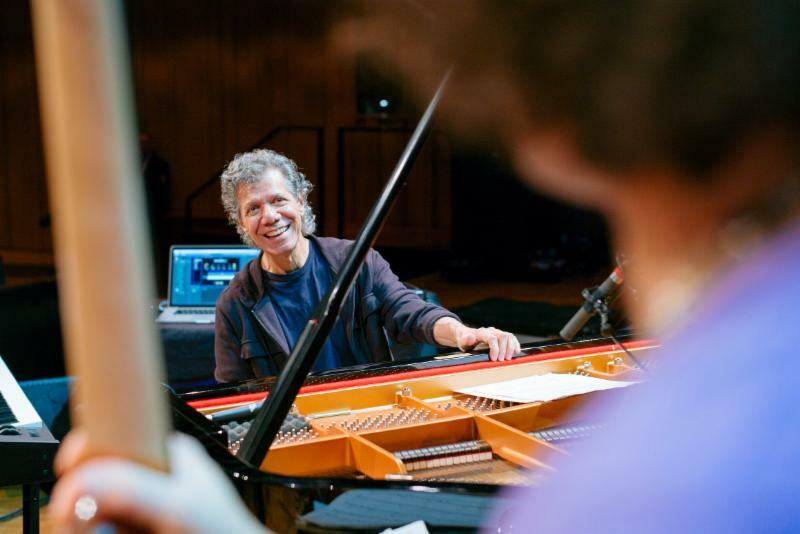 This fall, 22-time GRAMMY® Award-winning keyboardist and composer Chick Corea will make history with an unprecedented two-month 75th birthday celebration at The Blue Note, his musical home in New York City. Running October 19 through December 12, 2016, the 80-show engagement will feature Corea leading 15 legendary bands comprised of 60 musical friends from over half a century, marking a birthday celebration groundbreaking in scale, artistry and sheer musical power. "The Music of Return to Forever & More"
The premiere of two unique ensembles playing the music of Return to Forever over the course of two respective weeks: Acoustic featuring Ravi Coltrane (sax), Hubert Laws (flute), Avishai Cohen (bass), and Lenny White (drums); and Electric featuring John McLaughlin (guitar), Victor Wooten (bass), and Lenny White (drums). A celebration of the music of Miles Davis, featuring Kenny Garrett (saxophone) Wallace Roney (trumpet), Mike Stern (guitar), Marcus Miller (bass) and Brian Blade (drums). A deep dive into Corea's longtime musical partnership with drummer Steve Gadd through two different ensembles: Three Quartets featuring bassist Eddie Gomez (bass) and Ben Solomon (saxo) and The Leprechaun Band. Since the 1960s, Corea's pioneering work on electronic keyboards (spanning Miles Davis, Return to Forever and the Elektric Band) has inspired generations of electronic musical innovators. This special two-night run will offer Chick's latest take on all things electronic, joined by Marcus Gilmore (drums) and leading genre-defying electronic explorers (TBA). Corea's first Blue Note birthday run, marking his 60th anniversary in the fall of 2001, was a cathartic two-week engagement for a city just beginning to heal following the 9/11 attacks. The run produced the GRAMMY®-winning album Rendezvous in New York. In November 2011, he returned to The Blue Note with a month-long 70th birthday residency featuring countless artistic giants. This year's 75th birthday celebration marks his most ambitious Blue Note residency ever. "From the level of talent that will be presented to the number of shows to the overall duration, this is an unrivaled residency in so many ways," says Steven Bensusan, President of Blue Note Entertainment Group. "You never see an artist take residency in a venue for this amount of time consecutively, and on this scale." "Though most importantly, the fact that it commemorates our longtime friend and legend Chick Corea's 75th birthday makes this truly special, especially given Blue Note's deep relationship with Chick over the past 30 years," adds Bensusan. "We're looking forward to making history with Chick this fall." Chick Corea's 75th Birthday Celebration will feature two shows nightly, at 8pm and 10:30pm.